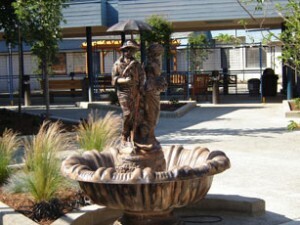 The soft tranquill sounds of water can be enjoyed in any setting when you find the right fountain. 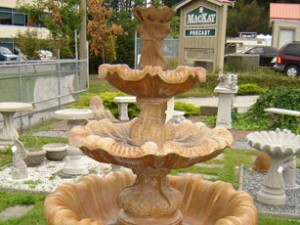 MacKay’s carry a variety of concrete patio style fountains for smaller spaces and larger yard 72” high x 48” wide fountains for people with a little more space available. MacKay’s also make a 3 pc. concrete waterfall available in natural concrete grey or integral coloured concrete. 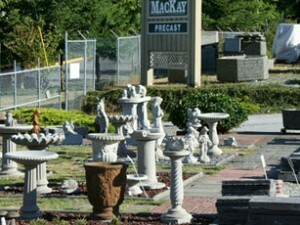 MacKay Precast Products manufactures wide variety of quality precast products such as: concrete BENCHES, concrete PICNIC TABLES, concrete PLANTERS, concrete LITTER CONTAINERS, concrete ASHTRAYS, concrete OUTHOUSES, and much more. We ship our products throughout Canada and the United States (U.S.A.). We are proud to work closely with provincial & state agencies, cities, parks, hospitals, schools, golf courses, malls, contractors and corporations to provide quality, reliable and cost effective concrete solutions to their projects. For more details on the complete line of MacKay Precast Concrete Products, please visit our Product Catalog pages. Get contact information such as telephone number and email address from our Contact Us page. Already know what you’re looking for? Please go straight to our Quote Form to submit your inquiry and our office staff will reply to you right away. Browse through our catalogue and request a FREE no obligation quote.